As promised from an earlier post, Electrolux Design Lab – Flatshare Fridge, I’m updating you on the winner of this year’s Electrolux Design Lab Competition. Rickard Hederstierna from the Lund Institute of Technology in Sweden stole the show with his “Cocoon.” It’s a device that cooks genetically engineered and pre-packaged meat and fish meals by heating muscle cells. 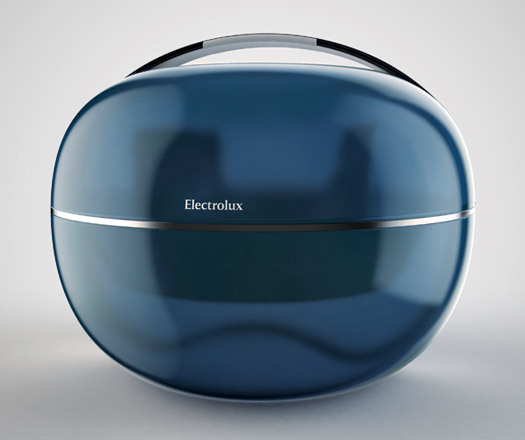 Rickard also received the 5,000 Euro prize and a six month internship at one of the Electrolux Global Design Centers. I am intrigued by the science behind Cocoon, but I wouldn’t necessarily want to eat the food it produces. A scene comes to mind from the futuristic movie, The Fifth Element, where the main character places a bowl with pellets into what looks like a microwave and out comes a whole chicken one second later. Feel free to tell me what you think about any of the devices shown here. Utilizing science to create food, Cocoon is a sustainable response to the worlds growing population and its desire to eat meat and fish. Second Place went to part beach ball part hummingbird “Water Catcher” designed by Penghao Shan from Zheijiang Sci-tech University, China. The “Water Catcher” is an automated device that dispatches small flying balls in the air to catch raindrops and then purifies the water for drinking. Receiving third place was “Renew” a smart steamer created by Louis Filosa from Purdue University, USA. Renew is a smart steamer that refreshes and cleans clothes. Speed junkies beware! The following article may cause heart palpitations or an all around shock to the system. The Autonomobile (ATNMBL) is a concept vehicle for the year 2040 that redefines the functions of a car. The designers, Mike and Maaike, have removed the standard steering wheel, pedals, and driver’s seat, proposing a car that drives itself and comfortably seats seven. They make a great point in stating that cars are capable of extremely high speeds, but most of the time travel at a moderate pace or at a snail’s crawl. Instead of rushing around or losing patience (and sanity) idling in traffic, sit back, relax, and enjoy the ride. You can even choose to take the scenic route. Autonomobile’s interior mimics that of our living rooms with a circular seating arrangement and a central display that controls navigation and even provides entertainment. The display also shifts to reveal a bar. The glass stretches from floor to ceiling giving riders an optimum view of their surroundings and the electric power components are stored underneath the seating and floor. Additional power is gathered by solar panels on the roof. Mike and Maaike suggest many advantages for driver-less vehicles including accessibility for the elderly or disabled, less congestion, and fewer traffic fatalities. They also acknowledge that it may take a while for people to widely accept this concept (me included). Don’t get me wrong, I think Autonomobile is a fabulous idea, but I have a problem with putting complete faith in technology. Let’s face it, systems malfunction. I would like to see the option for a manual take-over if a problem with the program does occur. No longer a fantasy, Mike and Maaike, also provide current examples in the effort to produce driver-less technology. Additional renderings of the Autonomobile are also available in their image gallery.